The Mantra experiment described in this particular post is practiced to invoke a Pishacha in order to get a cherished wish or desire fulfilled. A Pishacha is male demonic being, which resembles a Vampire and is described in Tantrik texts as a fearsome and dangerous entity, which primarily feeds on human flesh and blood. This article is based upon the information shared by Kapil Pramanick. The Yantra, which has been described in this post is based upon information provided by Kapil Pramanick. 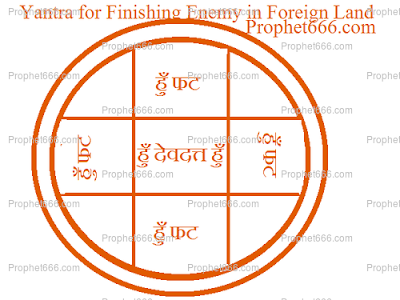 This Yantra is attributed with the specific qualities as being a remote enemy destruction Charm, which mean finishing off an enemy in another land, including another city, state or a foreign country. In this post, I have written about a Mantra for ensuring a Happy and Peaceful Start for any kind of movement, including commuting, travel, trip or voyage for job, business, financial, personal or pleasure. This simple Hindu Devotional Sanskrit Mantra invokes all kinds of protection from obstacles and dangers, including ill-health and the unknown on land, air or water during the day or night. In this post, I have described simple home remedies using Rudraksha Beads to cure painful and irritating skin diseases like Ringworm, Eczema and sever itching due to known and unknown reasons. Alopathy does not have to offer much in terms of permanent solutions for these Fungal Infections whereas Homeopathy can control them for longer periods of time. Each and every name of Ganesha describes a special quality and attribute of Ganesha. Each of these names having a special meaning and purpose, can be of immense help to practitioners of Mantra Vidya or Spirituality to fulfil a specific aim in life. In the post, I have written about Om – ॐ, which is also sometimes described as Maha Ganapati Pranav or the Ek Akshari Maha Ganapati Mool Mantra. The Vigyan Bhairav Tantra, which forms a part of the Rudrayamala Tantra is a treasure house for spiritually inclined people, trying to find ways and means to elevate their levels of consciousness or trying to enter the fathomless depths of their sub-conscious mind. The Vigyan Bhairav Tantra can also be of immense help to those spiritualists, the followers of Non-Dualism, Kundalini Awakening Aspirants, trying to merge their consciousness into the whole and realizing the true nature of the self and over-self.